I attended last weekend’s NECRONOMICON in Providence, RI, and lived to tell the tale! It was a great time filled with seeing old friends, making new ones and lots of Lovecraftian frivolity! I had a small table in the dealer’s room where I sold a few copies of both SARGASSO and HODGSON and spoke with a lot of people about ol’ WHH and various Hodgsonian things. A great time was had by all. On Sunday, I was honored to be part of the panel, “THE OTHER GUYS”, where I and several other scholars talked about some of Lovecraft’s contemporaries. I spread the word about Hodgson as much as possible but, in such a short time period, I had to be brief. It’s my hope that the panel, and my presence in the dealer’s room, will lead to other’s picking up Hodgson’s work as well. A number of interesting topics were brought up during the weekend and, as a result, I have a few other Hodgson projects in mind for the future. For one thing, I was frustrated because when someone would stop by the table and mention that they’d heard about Hodgson but never read him, I didn’t have any of WHH’s works for them to buy! Nor, did I notice, did anyone else in the dealer’s room. It’s hard to encourage people to read an author when you don’t have anything there to back it up with! This is something I will have to work on for the future. 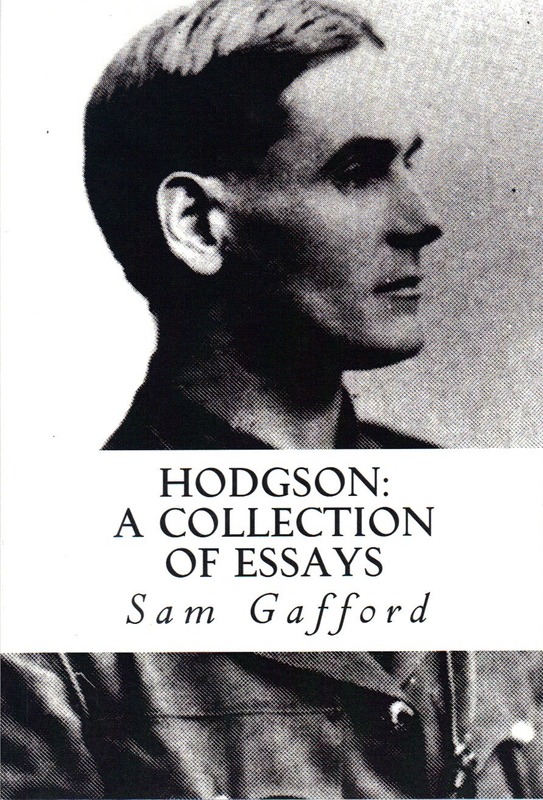 As a result of the convention, my stock of copies of SARGASSO and my book of essays, HODGSON, have been depleted. However, I still have a limited number of each available for anyone who either missed the pre-order or couldn’t attend the convention. 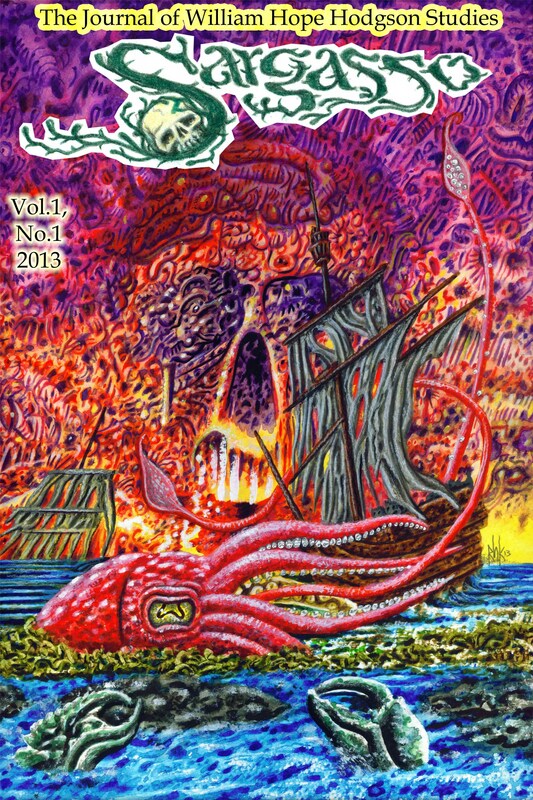 I actually have only 30 copies left of SARGASSO (out of a 150 copy print run) and this issue will not be reprinted. It can be ordered for $20 plus $5 s&h in US or $10 s&h foreign. As for HODGSON, I only have 10 copies of that book left which is $10 with same s&h rates. I will happily autograph either copy if desired. The reaction to SARGASSO has been very favorable which encourages me to continue on with a second issue for next year. Anyone interested in contributing should contact me at: sargassomagazine@yahoo.com and paypal payments can also be sent to that yahoo email. There is much work left to do on Hodgson so let’s get to it! Thanks so much for your comment! I’m glad you are enjoying the blog and find it useful. Please let me know if you do any work on Hodgson as I am always looking for new contributions for SARGASSO! Of course; I’d love to contribute to Sargasso! Sam, have you had a chance to mail out the pre-ordered copies of Sargasso yet? I am eagerly awaiting my copy! Joe, I am halfway through sending out the pre-orders and contrib copies but I can say that yours has already been sent so I should hope that you’ll have it sometime this week!